BlackBerry, once known to be the hotshot mobile phone in the corporate world is now back in the game.It actually took them a very long time to come up with an announcement after it had been literally thrown into the shadows of the mighty Android and the iPhone. RIM does talk about consumers liking them but it had already been settled as a phone for the corporate world and it all depends on how they, the businessmen, treat them. If the normal consumers are also satisfied with the latest updates from Blackberry, it would totally be a win-win situation. After watching the event, I am sure not only the businessmen but the consumers in general might be craving for these newly released smartphones. Research in Motion is no more. I am sure most of the people who know about BlackBerry doesn’t know that it’s RIM who manufactures the product. To make sure no more confusion takes place, RIM has been re-branded to Blackberry with a motto, One Brand, One Promise. According to the CEO of BlackBerry Thorsten Heins, he says that Blackberry promises to transform business and brand to mobile communications into mobile computing. What he actually tried to mean was that the all new BlackBerry will be mainly for multi-taskers who wants to have most of their smartphones. Normally when we want to multi-task in an Android or Apple device, we press the home button to take us to the other application, BlackBerry has made sure there will be multitasking without using the home button. As the leaks promised, BlackBerry officially released two new smartphones, the Z10 and the Q10. The Z10 is by far the best smartphone released by BlackBerry as the design language of the phone is unique compared to its predecessors. 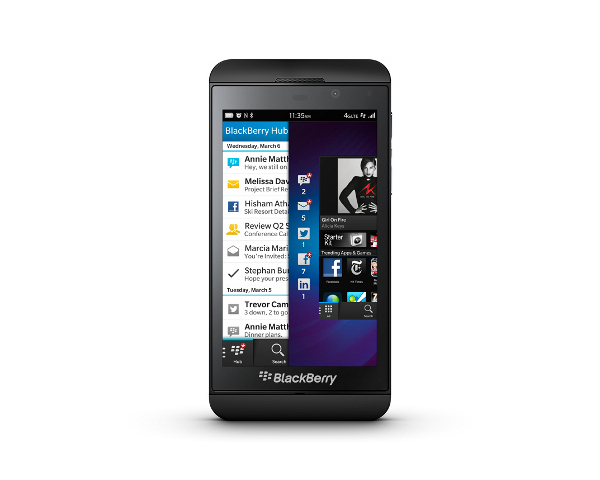 In the other way, the Z10 looks quite familiar to the iPhone 5 but much more better and has a corporate look in it. The 4.2 inch display (336PPI) smartphone is powered by 1.5 Ghz dual core CPU with 2GB of RAM having a storage of 16GB expandable upto 32GB with a microsd obviously. The Z10 has a 2 MP front facing camera which would be able to record 720p videos and a 8MP rear end camera perfect for 1080p videos. The backside of the Z10 has a texture surface which would be comfortable to hold. The Z10 carries a 1800 mAH power unit which is actually very less compared to all the other phones released elsewhere. When battery is becoming one of the main issues, BlackBerry seemed to have overlooked this factor. Possible competitors such as the Nexus 4 has a 2100 mAh power unit. Although it has a much powerful battery compared to the iPhone 5, 1440 mAh. Apart from the Z10, the other smartphone to be included in the family is the Q10. This phone has been made for those who still love to use the physical keyboard. The AMOLED display smartphone has a dual core processor, 2GB of RAM and 16GB of internal memory. For some reason, I feel the Q10 will be a much better competitor than the Z10. Though the Z10 will be demanded by all, the Q10 will surely be loved by the businessmen. The casing, according to the CEO, is stronger than plastic but they have managed to make the device lighter and thinner. Check out the video below to have a better look on the device. With the devices announced, I was much more interested to see what BlackBerry has accomplished with the new operating system. Will it be able to go near the mighty Android and the iOS? As I mentioned earlier, the CEO promised to make the lives of the multitaskers a pleasant one. By swiping and sliding with only your thumb, things will be getting much more easier than ever. For example, as shown in the event, if you’re watching a video in youtube and receive a notification of a new mail you would normally minimize the app and hop in to check the mail. With BlackBerry Peek, you no longer need to pause your video. A gentle slide from the left side and wala! you can get all your updates in one place! BlackBerry Flow is the name given to the concept of swiping down any application to simply minimize it. No matter how many apps you have running in the background, just with one swipe on the app, you will be able to minimize it. BlackBerry Hub, as you all have might heard, is the control center of literally evertyhing. You have all the channels in one place. Be it Facebook, Twitter and LinkedIn. If you have a new friend request, you can just accept it from the hub. Want to compose a new tweet? Hub allows you to do it. Update your Resume in LinkedIn? Do it right from the Hub. Post in Google+? Sorry. Didn’t see a trace of Google+ in the event. For those who spend an inordinate time in social media mainly Facebook and Twitter, the Hub will be their new spot. BlackBerry is well known for its keyboard layout and usability. Though the Z10 does not have any physical keyboard, they made sure even the non-physical keyboard should give out a good feeling when using it. If you are a busy man and always in a hurry with no time to spare to even type a message at ease, there’s nothing to worry! Each keys can have a designated word and by pressing each letter you get a word and eventually sentences! Translation has also become much more easier and better. Also you have the provision to only type a sentence without having a space between the words. How do you then organize the sentence? Just press the ‘space’ button once and your sentence will be restructured. BlackBerry Balance is another great feature preferably for those who work in an office. This is more like a profile mode but easily changeable within seconds. When in an office, you can easily change to another mode which would give your OS a more professional look without all the apps related to music, games, travel etc present. It would only have the apps that you would want to keep in that mode. The Z10 will be releasing in the UK on 31st of January, Canada on February 5th [$149.99 on a 3-year contract], February 10th in UAE and March in the US [ likely to have a price of $200 for a two year contract]. The Q10’s pricing and availability information haven’t been disclosed yet but according to them it will be released worldwide somewhere around in April. Let us know your views on BlackBerry’s new release in the comments below!